The Taj Palace Hotel, New Delhi is a perfect embodiment of all qualities synonymous with the quality of Taj Hotels, Resorts & Palaces. Standing apart in service, its facilities and of course, in its distinguished patronage, this hotel has played host to Heads of State, corporate moguls and high profile businessmen from across the world. 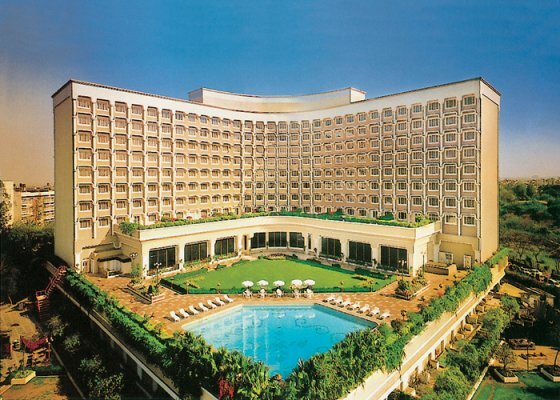 Nestled in six acres of lush greens in the exclusive Diplomatic Enclave of the city, Taj Palace Hotel is the only one in the top-of-the-line category near Gurgaon, and a mere 10 minutes drive from the airport. Centrally Located In The Embassy Area In Close Proximity To Business District. The Hotel Property Covers 7 Acres With Landscaped Gardens. A White Marble Staircase Sweeps Down From Lobby. Four Restaurants Serve Both Regional And International Cuisine. Blending ancient Indian wisdom with contemporary therapies, Body Essence Spa offers the best in Indian rejuvenation therapies ranging from Indian aromatherapy massages, time – honored Indian treatments, body scrubs and wraps. Some of our rejuvenation signature therapies include Invigoration, Aromatic Bliss and Harmony spas. The rejuvenation traditional therapies have Balinese, Traditional Indian and Swedish massages. Our spa experiences are offered by trained experts using exclusive natural products in a fresh and harmonious setting. Signature experiences bring guests the essence of traditional royal wellness and harmony. Our Fitness Centre facilities include a gymnasium with steam and Jacuzzi. Yoga and massage are also available. The outdoor pool has a depth of 4 feet to 10 feet. To unwind after a long day, the hotel offers many options. Browse the shopping arcade and lifestyle boutique, visit our beauty salon or arrange for an astrologer. Our concierge can get you a tee time for 9 holes of golf nearby. And of course, our many bars and restaurants provide very delicious ways to enjoy your stay at the Taj Palace, New Delhi. 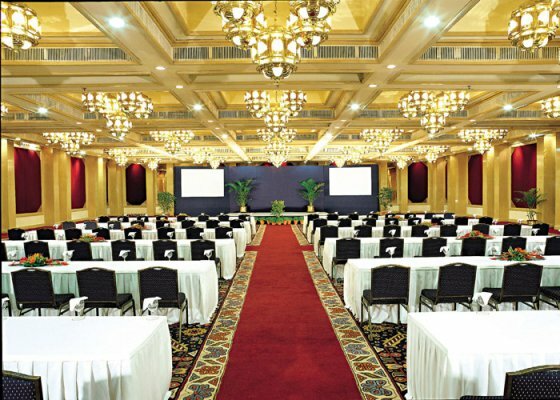 Taj Palace Hotel provides seamless meeting and conference services to ensure the highest levels of creativity, convenience and efficiency for every business need and event. In addition to our conference rooms, we provide a 24-hour, technology-driven business centre on the mezzanine level. Video conferencing facilities, photocopying, secretarial services, translations, fax, and other electronic and communication equipment are available for our guests. 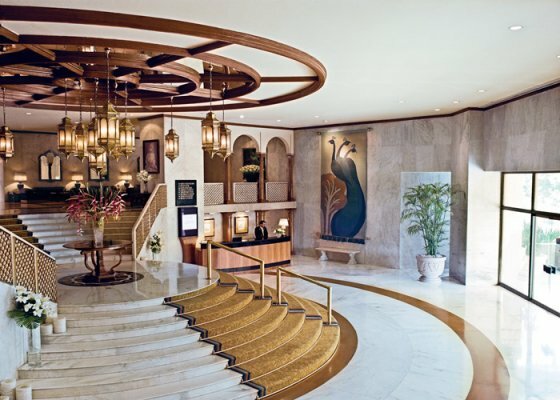 For meetings and events that leave an enduring impression, the Taj Palace Hotel has a distinctive allure. From small meeting rooms to grand scale conference centers, we bring to every event a dedicated focus and unbridled enthusiasm. Whether you’re planning a company strategy session, a corporate cocktail party or a celebratory banquet, you always have our undivided attention. The hotel puts at your disposal 40000 sq feet Conference and Banquets area with a spectrum of 11 independent, tastefully appointed halls and two well maintained lawns accommodating 500 people each. Located on the main road with an exclusive approach to the banquets and ample parking space, Taj Palace can cater to intimate small events to large grand receptions. At Taj Palace Hotel, you get combinations and possibilities of space and seating arrangements, accessibility to high quality audio visual equipments, creative menu options from varied cuisines and of course themes which make business at the hotel not unusual but extraordinary, especially for hosting residential conferences, meetings and corporate events. Taj Palace is the first choice for International conferences, Media Conclaves, Awards Nights, Car Launches, Exclusive Ministerial and Head of State meetings and sit down dinners. With two beautiful lawns and two of the largest pillar less halls like Durbar and Shahjehan, it makes a perfect choice for a dream wedding and Cocktail receptions. For conferences, The Taj provides comprehensive state of the art facilities equipped with wireless broadband Internet access and the ability to include simultaneous translation in all languages. From mood lighting to video conferencing and any other technical service that you might need. Taj Palace Hotel offers you both space and the facilities to meet all your event requirements, with that inimitable Taj touch which makes every occasion truly memorable. It is details that differentiate the average from the superlative, and the Taj Palace Hotel from anywhere else. Here, not only will you have a sublime space for your wedding, but all the flexibility you need to do it your way. You can customize your special day to make it truly yours. The décor, the menu, the table settings, even the folds in the napkins can be tailored to your specifications. Exquisite theme dinners can also be organized with the help of our experts. The 402 lavishly appointed rooms and suites of the Taj Palace Hotel, New Delhi offer a most impressive repertoire of amenities and services. 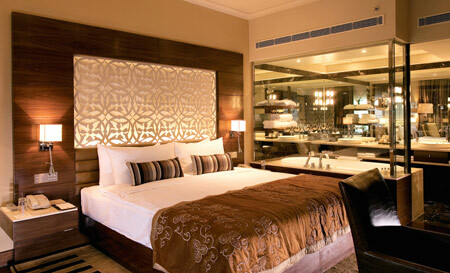 The hotel has a large variety of rooms to match the requirements of discerning guests. Choose from Deluxe, or Luxury Rooms, The Taj Club Rooms and Suites, Executive Suites, Luxury Suites and the Presidential Suite. 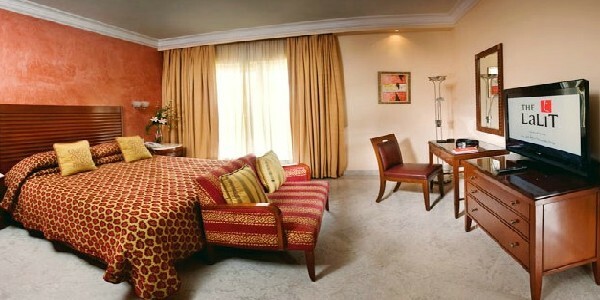 All rooms are tastefully decorated, impeccably furnished and come with round the clock hospitality and exemplary service. 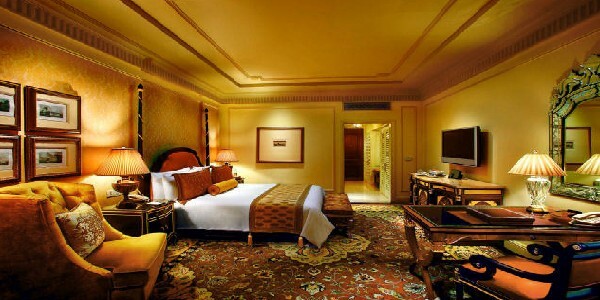 Taj Palace Hotel, New Delhi offers guests a choice of Deluxe Rooms and Luxury Rooms. All guestrooms are luxuriously appointed with central air conditioning, these rooms measure 304 square feet and feature luxuriously large bathrooms. 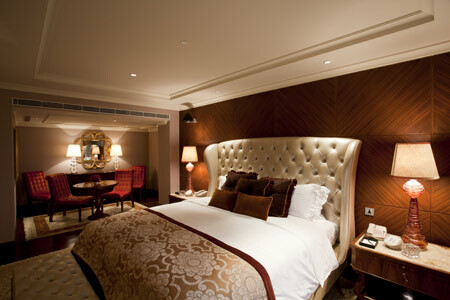 The new Club Rooms and Club Suites of Taj Palace Hotel, New Delhi, are elegantly styled with a contemporary mood. A rich palette of fabrics combines with the warmth of walnut veneers and dark Italian marble to create a truly sophisticated interior. Subtle, decorative accents, derived from the architectural vernacular of Mughal Delhi, inspire in visiting guests a true sense of place. The Club Rooms feature king size beds, a personal bar, comfortable lounge seating and a generous work desk. They also feature the latest technology for Internet and telecommunications and are equipped with wide screen LCD TV, DVD player, digital safe, and intelligent lighting controls. The Club Room’s main space flows seamlessly in to a generous four-fixture bathroom, complete with soak tub and rain shower. The separating glass partition gives an expansive feel to both the room and the bathroom, and allows the surrounding parkland views to be enjoyed from the bathroom. These elegant and well-equipped environments are designed for guests who expect the finest quality in their surroundings. Each suite offers a different décor and refined style. Two spacious rooms and a queen bed surrounded by fine trappings inspire peaceful relaxation as does a cozy lounge chair by the window so you can overlook the city. 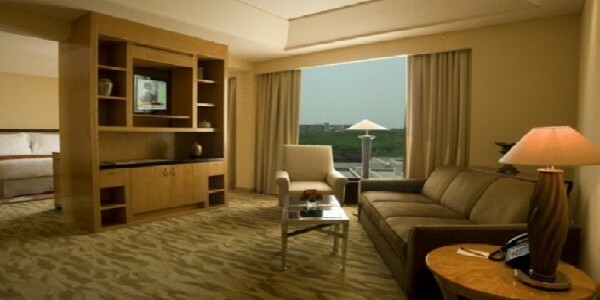 Executive suites are comfortably made up with all the latest amenities like huge couch and reading table. The luxury suite exerts its pull from the moment you step inside. From the richly carved light hued wood panels to the silk furnishings, all details combine to create the subtle harmony of relaxed, sophisticated living. The wood panels are perfectly complimented by marble furnishings, matching interiors and fine carpeting. 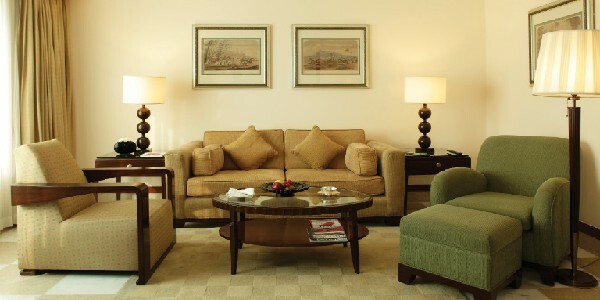 The most remarkable feature of the suites is the art by some of the India’s most renowned painters. The suite houses brilliant works from artists such as Mr. Alok Bhattacharya, Mr. J. Nelson and Mr. Jatin Das, to name a few. The separate dining and conference area take luxury to extraordinary heights. 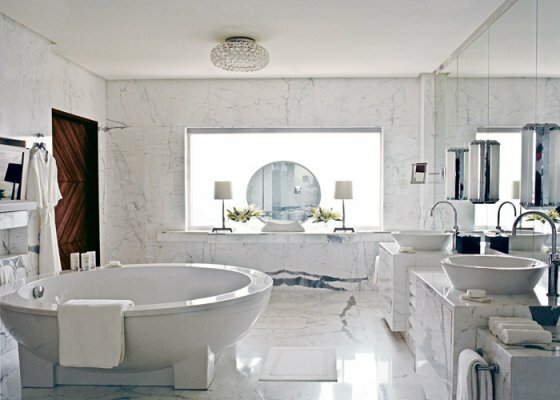 The luxury of the suite extends to the smart dressing room and superior washroom complete with extra posh amenities. Experience an evening of romance and luxury at the Taj Palace Hotel’s unique Garden Suite. The marvelous décor has beautifully coordinated deep rich wood paneling, rust coloured drapes with hint of Orient décor. The spacious suite opens up to a finely manicured garden complete with blooming flora over looking the abundant greens of the area. The interior of the suite brings the serenity and exquisiteness of the garden inside with subtle floral motifs on the wall and panels. The walls of the suite are adorned with tasteful works of art. The room has been copiously adorned with extravagant furnishings to match the taste of its distinguished guests. The Suite is elegantly styled with a contemporary mood. Rich palettes of fabrics combine with the warmth of walnut veneers and dark Italian marble to create a truly sophisticated interior. Subtle, decorative accents, derived from the architectural vernacular of Mughal Delhi, inspire in visiting guests, a true sense of place. The Bed room’s main space flow seamlessly in to a generous 5-fixture bathroom, complete with soak tub, rain shower and separate his & hers sink. The separating glass partition gives an expansive feel to both the room and the bathroom, and allows the surrounding parkland views to be enjoyed from the bathroom. The Grand Luxury Suite is handsomely appointed with two opulent bedrooms, two bathrooms, a pantry, a powder room and a large terrace. 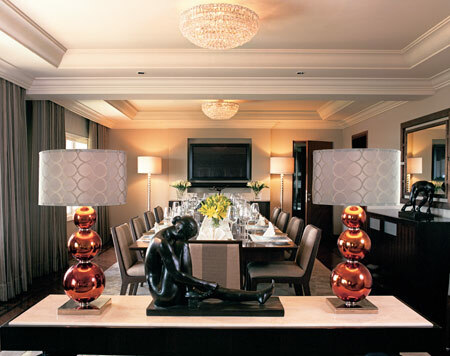 The Presidential Suite of Taj Palace Hotel, New Delhi is a vast expanse of luxury and comfort decked in rich taupe tones with exotic zebrawood and rich ebony accents. An opulent palette of fabrics adds even more polish to the truly exclusive interior. The overall effect is handsome and contemporary, with subtle decorative accents of Mughal Delhi. Fitted with intelligent lighting controls and state of the art audio visual system from Bang & Olufsen, the remarkably spacious Grand Presidential Suite features a generously sized bedroom, a large living room with an adjoining dining room that seats 12 and breathtaking views of the trees outside. Furnished with luxurious oversized bed and European sized seating, the suite also has access to a private study with a treadmill and a fully fitted pantry. There is also an option to add two additional bedrooms to accommodate more guests if required. The specially designed dressing room with separate wardrobes for gents and ladies leads to a marble clad multi – fixture bathroom with ceramic fixtures from Duravit, fittings and a tropical rainshower experience from Dornbracht and a freestanding Hoesch whirlpool bath. The suite also includes a dedicated room with steam facilities for private spa treatments. The luxury of the suite incorporates Frette linen, digital telephones, wide selection of coffee – table books in the suite’s study, custom designed acoustics from Bang & Olufsen, iPod Stations, Music players, Posture Pedic Mattress, Bvlgari toiletries, Swarovski Crystal Chandeliers, and a personal treadmill amongst a few. 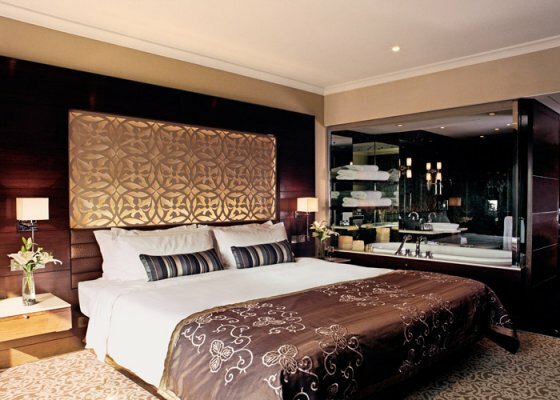 Tata Suite is outstandingly crafted for the cosmopolitan global traveler, royalty and Heads of State. Taking inspiration from the traditions established by its founder, Sir Jamsetji Tata, the Tata Suite is a tribute to his vision and values – a symbol of Indian hospitality. The suite offers a fusion of superlative service and contemporary luxury embellished in an ambience of stateliness that is unparalleled. It creatively combines luxurious environs and the best modern amenities with personalized and warm service for the discerning. With an impeccable design and style pattern carefully cementing each contour of 6500 square feet, Tata Suite embodies all things grand and opulent. The lavishly appointed interiors are a union of rich Mughal ornament and pattern with elegant, modern silhouettes and details, creating an exceptionally indulgent and luxurious residential experience. 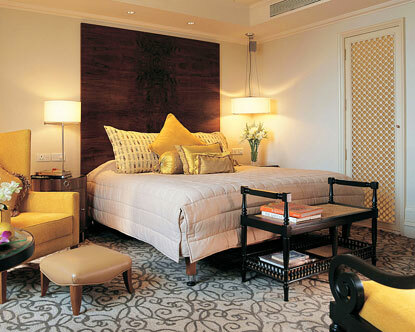 The suite encompasses elements of contemporary design and decorative touches from Mughal heritage. Fine craftsmanship of furniture and fittings, striking color scheme, carefully selected objects d’art reflect a meticulous attention for detail. The Taj Palace Hotel is proud to offer finely nuanced cuisine served by some of the best chefs in India and abroad, catering to every palate and preference. From casual, all-day eateries to formal fine dining guests can look forward to authenticity, excellent service, gourmet cuisine and a warm and welcoming ambience. We invite our guests to enjoy distinctive dining experiences that reveal the finest in Indian and international cooking techniques. As a unique touch, Pashminas and reading glasses are available in each restaurant to ensure our guests’ comfort. Enjoy a menu full of firsts only at Blue Ginger, capital’s contemporary Vietnamese restaurant. Experience the brand new culinary journey of the unexplored land of Vietnam at Blue Ginger, a perfect place to enjoy the ultra- fresh flavors of Vietnamese. Visually stunning in every way, Blue Ginger makes an ever lasting impression on the global palate. Blue Ginger fare brings together an aromatic blend of flavors drawn from Vietnam’s past. The low-calorie, light and tantalizing, food adds allure to the exhaustive menu, which includes plenty for vegetarians, salad, soups, grilled curries and stir fries. The menu at Blue Ginger is contemporary, influenced by Chinese, Indian, Thai and French food, yet has a very distinct flavors and texture of its own. The food could be classified into three categories- North Vietnamese which is traditional and reflects a Chinese bend; central reflects the monarchy and northern cuisine is modern and trendy influenced by French and Indian bend like baguettes with curries. It also has herbs like mint, cilantro, lemon grass, red chilies from Cambodia and Thailand. Blue Ginger has a balanced flavour- includes sweet sour and regular food. Blue Ginger takes its’ design cue from the influence of the French-Colonial aesthetics that still suffuse Vietnamese society. 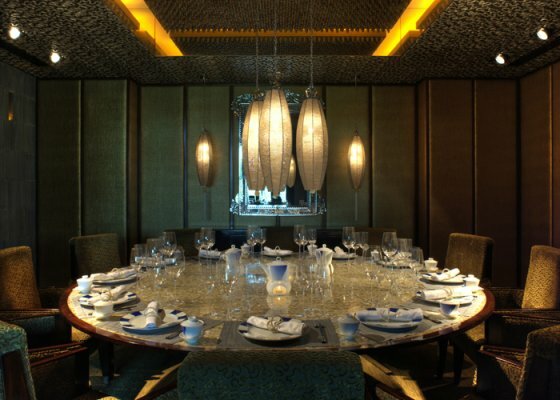 Art-Deco reproductions of classic Ruhlmann furniture- a design style used at the Bao Dai Palace in Dalat, are appropriately selected for this world class restaurant. A special ceiling in the main dining hall is constructed from cast bronze panels in the shape of croissants – or a snail motif that appears as the hair of Buddha. Bespoke ‘Drouant’ Dining chairs are faithfully reproduced from the 1920 Ruhlmann originals. Indian Rosewood frames and custom vermiculated fabric add a touch of old-world, French-Colonial Art-Deco glamour. This bar and award-winning restaurant captures the mystique of the legendary Orient Express, which has been traversing Europe for over a century, transporting diplomats and duchesses, courtesans, private eyes and spies in regal splendour. The dining area successfully recreates a carriage in the train, and with it, the ambience of a bygone era. The Orient Express has carved a place for itself in literature, playing an important role in such works as Agatha Christie’s “Murder on the Orient Express” and Ian Fleming’s “From Russia With Love.” The menu traces the train’s journey through the continent, culling specialties from each region through which the train passes. The table d’hote menu consists of three to four courses, including the entrée before the main course, a tradition only observed in a very few exclusive restaurants. 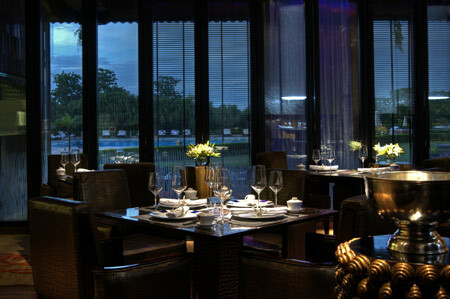 Although the Orient Express menu includes cuisines from all over the continent, the focus is on classical French. The meal commences with an amuse bouche and sorbets appear between courses to cleanse the palate. Understated sophistication rules and outside the ‘train’, in the bar area, a jazz singer and accompanying pianist complete the Orient Express experience. Regular guests are treated to initialized napkins, while special menus are provided for all celebration tables. Hours: Dinner – daily 6:30 p.m. to 11.45 p.m.
For all those who think that light, healthy Indian food is an oxymoron, Masala Art is the answer. At Masala Art, authentic spices are used judiciously to complement, rather than to overshadow the other ingredients. 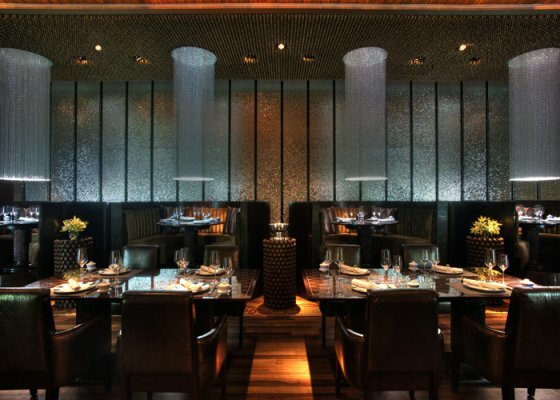 A show kitchen, contemporary décor, and a cuisine inspired by art of renowned artists Paresh Maity and Prabhakar Kolte, makes Masala Art a highly memorable dining experience. In the kitchen, authentic spices are used judiciously to complement, rather than to overshadow the other ingredients. The unique grinding machines whip up fresh Masalas for each meal. The show kitchen is interactive, a feature usually associated with western cuisines. Guests can actually tell the chef exactly how they like their meals. Indian breads too, are baked on a griddle atop a unique trolley. The show kitchen is interactive, a feature usually associated with western cuisines. Dishes include a choice of Murgh badam shorba, Tamatar dhania shorba, Jeerewala murgh tikka, Roti pe boti, Shammi sampler, Dahi aur sing dana ki tikki, Mathania mirch ka murgh, Paneer kaliyan, Gucchi mutter, Bharwan bhindi, Ajwaini malai kofta, Chole and Langarwali dal. Hours: Lunch 12:30 p.m. to 2:45 p.m., Dinner 6:30 p.m. to 11:45 p.m.
Kafe Fontana is a combination of a Tuscan Palazzo and a Californian conservatory. It’s about earthy colors, the aroma of good food and live cooking. A fountain takes center stage in the bright atrium. One length of the restaurant is covered with a show-kitchen where our chefs conjure up a delectable assortment of pizzas, kebabs, barbeques and other dishes spanning countries like Turkey, Greece, Lebanon, Morocco, Spain, France and Italy. The restaurant overlooks the pool with its landscaped gardens, green palms, putting green and blue shimmering water, all of which can be viewed through the lovely Venetian blinds which are gently turned in as the day progresses in summers or left open in winters to let in the warmth of the afternoon sun. Life music adds to the atmosphere. Guests relish both Indian and international favourites, from carpaccio to fish and chips. A dieters’ corner has been specially conceived, by popular demand, where ingredients for salads and low-calorie whips please the palate and flatter the waistline. The restaurant packs a crowd on Sundays for its delectable brunch. The Blue Bar is about food as much as it is about drinks. The cuisine does not have boundaries. Guests are served fresh and premium ingredients, be it fruit purees, imported herbs, oysters, or India inspired spiced starters. The snack menu at The Blue Bar is a collection of very eclectic tastes. The menu has a delicate balance of liquor, fruits and delicious appetizers. Located along the perimeter of the hotel, facing the lush central garden and pool, it offers unique ambience, be it indoors or outdoors. Guests inside can view water flowing outside which seems like a water body over curtains. Sitting outside you can enjoy the outdoors at the timber alfresco deck, which is greened with giant bonsai trees and large over-scaled seating with bespoke standing French baroque torchers. The Blue Bar’s alfresco dining pampers those who want to lounge on contented conversational sofas. The bar has city’s only outdoor foyer. The design and element has an ascent of Bohemian art. 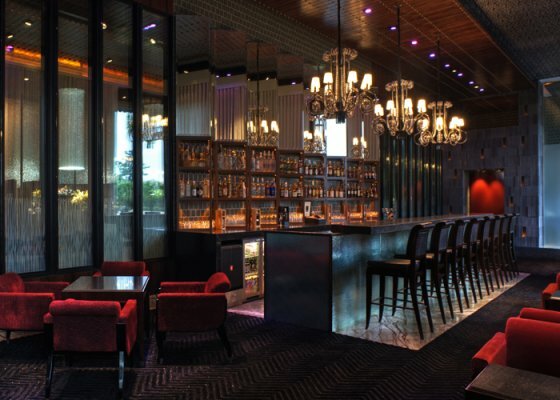 Textures and colors used to design the dazzling bar are exceptionally edgy. The bar looks enormously stunning with black carpets, shimmers and white curtains. The ox blood red upholstery sits on metallic black carpeting. A special feature of transparent concrete is constructed at the bar top. The black Luccon top looks solid in the daylight, but as the night falls, millions of fiber-optic threads allow light to pass through the stone and onto your drink placed on the bar. This is a place where you can really savor the taste of good tea or a coffee and a premium selection of wine and spirits. The scene is perfect for tête-à-tête and lingering in the traditional a ‘Viennese Style’ coffee house. An exhausting array of fine, single estate coffee’s and designer teas will keep caffeine lovers occupied for hours. Savories, small bites and a vivid selection of desserts means one need look no further for sustenance. The Tea Lounge is prominently located in the lobby level overlooking the putting green and the pool. Liqueur service (only selected beverage wines, cognac, rare whiskies and premium scotch) is available in the evenings on the Verandah Lounge just outside. Hours: Daily 9:00 a.m. to 10:00 p.m., alcohol service from 7:00 p.m. to 10:00 p.m.
New Delhi – 110 021,India.